As you can see I have only been using three skin care products this month and this is because my skin has turned even more sensitive than usual. It's almost like I only have to look at my skin in the mirror and it goes all red, dry and itchy. This trio though has really helped to keep my skin hydrated but they're gentle enough not to irritate my skin even further. They're also really light on the skin, especially the cleansing balm, and it feels like I haven't put anything on my face but I'm still taking care of it. 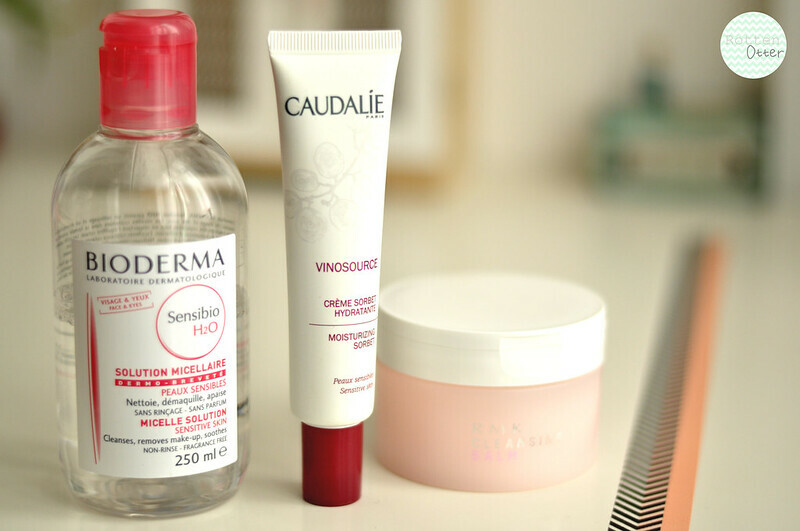 Bioderma Micelle Solution // Caudalie Vinosource Moisturising Sortbet // RMK Rose Cleansing Balm. I´ve been using Bioderma Sensibio for years. It is amazingly gentle on the skin. I tried Bioderma Sebium (nlue one) and it did help a lot with my acne. Both are very nice, but Sebium is not for very sensitive skin.